The classification of finite p-groups up to isomorphism is an intricate problem in group theory. In particular, a classification by order seems to be hopeless in general. In 1980, Leedham-Green and Newman suggested to classify p-groups by coclass. This has led to a new research area which delivered a deep insight into the structure of p-groups. New approaches and results concerning a classification by coclass have been developed since 1999, and it is known that the 2-groups of fixed coclass can be classified. A fundamental tool in this approach is the investigation of the coclass graph associated with these groups. For odd primes, a similar classification is still open. As an important special case, the author Heiko Dietrich investigates the p-groups of coclass 1, that is, the p-groups of maximal class. These are the p-groups of order p to the power of n with nilpotency class n-1. He gives a survey on the known structure of these groups and he proved two types of periodic patterns in the associated coclass graph. 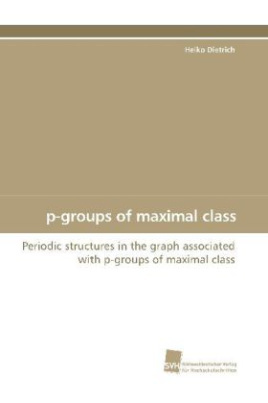 These patterns are reflected in the structure of the groups and the achieved results strongly support the conjecture that the p-groups of maximal class can be classified.